I am tempted to attach arms and legs to an old soccer ball, as that is what I've been doing a lot of lately. The high school soccer team has been doing very well, and it has been fun to see. But getting kids from point A to point B, and watching the games, etc, takes time. Instead I will leave you with a lovely inspiration picture. Back in 2011, my family traveled to New Hampshire to Withington's so I could document this doll before it was sold at auction. It's a nice memory. 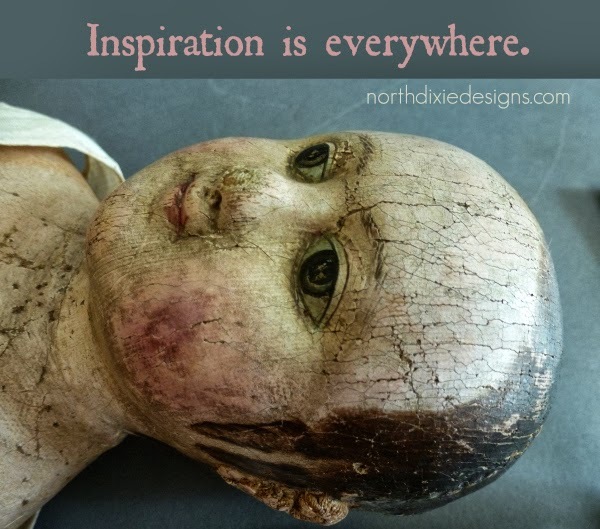 I love this old folk art doll so much! Well, that's a big dose of inspiration, for sure! It's exciting just to see her in picture, but to actually see and touch one of these old beauties... I am enjoying following along with you on your 31 days of doll making. Yes, it does! taking pictures of your own work from odd angles while in process helps, too.